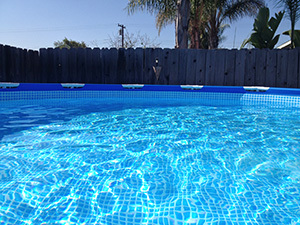 Above ground pools are an affordable investment that can provide years of backyard recreation, and can help kids to become confident swimmers. This site features tips and product information to help you select, maintain, upgrade and enjoy your above ground pool affordably. With a little planning and preparation an above ground swimming pool is reasonably simple to set up and with the right products, easy to maintain. Work out a budget and do some shopping around. Maintenance is required and should be considered in your budget. 1. Consider the placement of the above ground pool. You’ll want to maximize direct sunlight for it’s radiant heating of the water and avoid falling leaves from nearby trees. 2. Take time to level the area. This will likely require some digging and raking. 3. Establish a soft foundation on your level area. A few inches of sand create a nice cushion. There are also products available that can be placed under the footprint of your pool to soften the base and protect the pool from weeds and other aggressive grasses. Great deals can be found at the end of the summer season at many major retailers both online and in stores. We’ve spotted Intex above ground pool kits at Walmart, Target, Costco and through several online sites. We purchased our Intex pool (15′ x 48″ round) on Walmart.com and used their free site-to-store shipping with pickup at our local store. Amazon.com also ships some above ground pools free if you are an “Amazon Prime” customer ($99/year with many benefits beyond shipping speed).